Do you use sortphotos? Leave a review! SortPhotos is a Python script that organizes photos into folders by date and/or time (year, year/month, year/month/day, or other custom formats). If you're like me then your growing collection of files are contained in a bunch of folders, some with a date like Sep 2010 , and others which names like Camping Trip . SortPhotos takes this collection of folders and files and reorganizes them into a hierarchy of folders by almost any custom date/time format (by default it is by year then month). It will work with any file, but works best with image and video files that contain EXIF or other metadata formats because that stays with the file even if the files are modified. 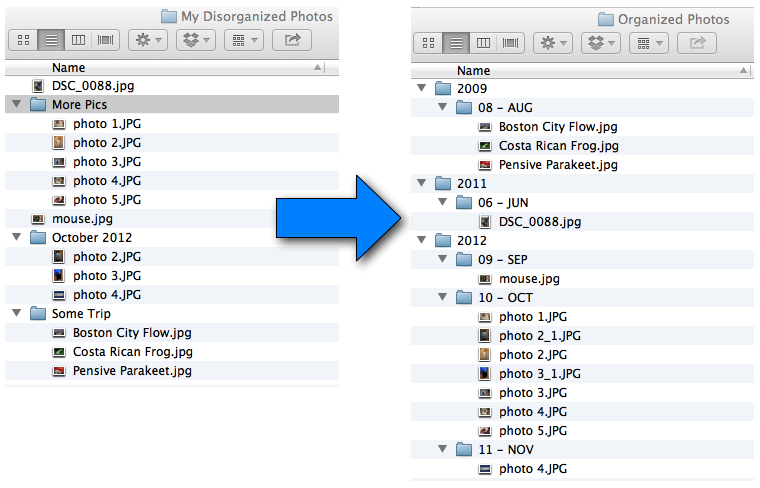 The script is also useful for transferring files from your camera into your collection of nicely organized photos. The simplest usage is to specify a source directory (the directory where your mess of files is currently located) and a destination directory (where you want the files and directories to go). By default the source directory it is not searched recursively but that can changed with a flag as discussed below. There are several options that can be invoked. For example the default behavior is to move files from your source directory to your destination directory. Note that it is much faster to move the files rather than copy them (especially if videos are involved). However, if you want to copy this is done with the -c or --copy flag. By default, only the top level of the source directory is searched for files. This is useful if you dump photos into your top directory and then want them to sort. If you want to search recursively, use the -r or --recursive flag. If you don't want to see details on file processing use the -s or --silent flag. It will still show overall progress. If you just want to simulate what is going to happen with your command use the -t or --test flag. No files will be moved or copied, but all the moves will be simulated showing you how the files would be reorganized/renamed. The possibilities go on and on. This would create files like: 2003_1031_1544.jpg. By default the script keeps the original name and the original extension. In all cases a unique digit in appended in the case of name collisions. SortPhotos will always check to make sure something with the same file name doesn't already exist where it's trying to write, so that you don't unintentionally overwrite a file. It this occurs it will append a number on the end of the file. So for example if photo.jpg was taken on June 1, 2010 but 2010 > June > photo.jpg already exists then the new file will be moved as photo_1.jpg and so on. SortPhotos will go one step further and if it finds a file of the same name, it will then run a file compare to see if the files are actually the same. If they are exactly the same, it will just skip the copy (or move) operation. This will prevent you from having duplicate files. However you have the option of turning this off (not the name comparison, that will always happen, just the weeding out of duplicates). This option would be useful, for example, if you are copying over a bunch of new photos that you are sure don't already exist in your organized collection of photos. Invoke the option --keep-duplicates in order to skip duplicate detection. The argument to the flag should be an integer between 0-23 corresponding to the hours of the day starting at midnight. Note while sortphotos.py was written in a cross-platform way, the following instructions for automation are specific to OS X. For other operating systems there are of course ways to schedule tasks or submit cron jobs, but I will leave that as an exercise to the reader. An an optional setup, I like to automate the process of moving my photos. This can be accomplished simply on OS X using Launch Agents. First edit the supplied plist file com.andrewning.sortphotos.plist in any text editor. On line 10 enter the full path of where sortphotos.py is stored. On line 12 enter the full path of your source directory (I use Dropbox to transfer photos from my phone to my computer). One line 13 enter the full path of the destination top level directory (e.g., /Users/Me/Pictures). Finally, on line 16 you can change how often the script will run (in seconds). I have it set to run once a day, but you can set it to whatever you like. and you should see the Agent listed (I grep the results because you will typically have many services running). If you want to stop the script from running anymore just unload it. SortPhotos grabs EXIF data from the photos/videos using the very excellent ExifTool written by Phil Harvey. @nueh fix for Python 2.5 (which you might be stuck with on a NAS for example). Another complete rewrite. The script retains the powerful metadata reading capabilities of ExifTool but now uses its own file processing as it did before for more flexibility. Specifying what tags to look for required some guesswork, so this version automates this by looking through tags for the oldest date. Restrictions can be set on what groups/tags to search across. Some flags have changed. See rest of README. duplicates can now be automatically removed (only if name is exactly the same and a file hash is exactly the same). The version is a complete overhaul of the past script. It now makes use of the excellent ExifTool by Phil Harvey, which amongst other things gives us the ability to read EXIF or other metadata for a wide range of file types. Before we were limited primarily to jpg and a few other image types, but now most video formats are included as well as a wide range of RAW file types. ExifTool also provides a lot of the file moving functionality that was previously contained in this tool so sortphotos.py is much simpler and has a few new capabilities. There are a few features that were in sortphotos.py that have been left out in this new version. Because we are taking advantage of implementation features in ExifTool to handle the file management, we gained some capabilities but also lost some. Missing features are detailed below and may be re-added in the future. The usage of the script, while very similar to how it was before, is not perfectly backwards compatible. If one of the critical features for you is missing then you shouldn't update at this time. If you are using sortphotos.py in other automated scripts then you should update those to conform to the new usage. Duplicates are not automatically removed. Before if two files were exactly the same (through a hash) one would be removed. The new version does not remove any files. If two files have the same name it will not overwrite but will append a number at the end. the --day-begins feature is not included. Before you could specify an hour that you wanted the day to start so you could group early morning photos with the previous day, but because of the way things are currently implemented this was not straightforward to add back in. Copyright (c) 2013, S. Andrew Ning. All rights reserved. almost 3 years How to Include Camera Make and Model into Destination Folder? over 3 years Bug when an exif data is of type "HH:MM:SS" like "18:07:03"
almost 4 years Can't use an undefined value as a SCALAR reference at <shortened>\src\Image-ExifTool\lib\Image\ExifTool.pm line 6303. Added option to include original filename in renamed file. Keep up with changes to sortphotos! Would you tell us more about sortphotos?